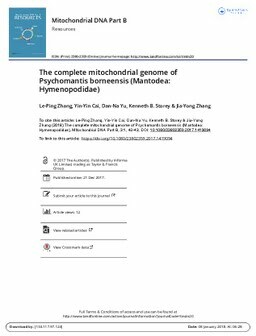 The complete mitochondrial genome of Psychomantis borneensis (Mantodea: Hymenopodidae) was successfully sequenced. The mitochondrial genome is found to be 15,493 bp long and is a circular molecule containing 37 genes (13 protein-coding genes, 22 tRNAs, and 2 rRNAs), typically found in other mantis mitochondrial genomes. The AT content of the whole genome was 72.4% and the length of the control region was 697 bp with 79.9% AT content. A phylogenetic tree was constructed based on the BI and ML analysis of 16 species of Mantodea. The results showed that P. borneensis was a sister clade to (Anaxarcha zhengi + Creobroter gemmata) (Hymenopodidae). The monophyly of the family Mantidae and the genus Theopompa, Hierodula, and Rhombodera were not supported. The outcome of this study will provide a useful data for population genetics studies as well as serve as a tool for better characterizing phylogenetic analysis of Mantodea.